The fishing industry is flooded with countless topwater lures. With minimal effort, you’ll find some that swim, walk, chug, spit, buzz, flutter, gargle, dart, dash and bubble. In all of the excitement over new baits and presentations, be careful not to overlook one of the most effective topwater lures for summer bass fishing—the prop bait. Two-time BFL All American and custom lure designer Kip Carter is well renowned for his prop bait prowess. While many anglers flock to deeper water in the heat of the summer, Carter’s prop bait bite is at its best. Summertime bass are notorious for being stubborn and prop baits have some unique characteristics that can coerce some amazing strikes from even the most lethargic bass. I was in the boat with Carter and it really opened my eyes to the effectiveness of prop baits. More times than not, he would let me pitch a soft plastic or toss a shallow crankbait into areas before he would ever make a cast. After a few of my fruitless attempts, Carter would sling his prop bait into the same area and whack a 4-pounder. Needless to say, I’ve quickly become a believer. Bass anglers love to tinker with lures, and Carter is no exception. After years of customizing several mass-produced prop baits, he decided to expand his Bass Hound Crankbaits line and make his own from scratch. 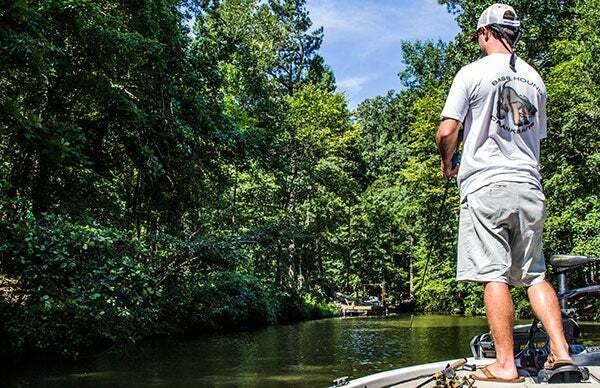 In order to increase his number of bites and hookup ratio, there are 3 characteristics he heavily stresses when it comes to choosing a quality prop bait. Carter is also a big proponent of a prop bait that doesn’t move very far when twitched. This technique is most effective when target casting, so he aims to keep his lure in the most productive strike zones for as long as possible. The final ingredient to an effective prop bait is balsa wood, according to Carter. Using prop baits is a very visual presentation, making buoyancy an important factor to consider. When most of us consider topwater techniques, we immediately think of lowlight conditions. Carter, however, catches his biggest summer bass when the sun is at its brightest. Shade plays a big role in his prop bait strategy. Although he’s had some success using prop baits in stained water, Carter does most of his damage in clear water areas. His strategy for finding big bass is largely dictated by recent precipitation. Carter likens his prop bait presentation to that of a topwater popper. He uses very short, downward rod twitches to achieve the optimum presentation. Many bass fishing presentations allow for some wiggle room in regards to line selection, but that isn’t the case with prop baits. To reduce frustration and allow for the most natural presentation, Carter uses 17 to 20-pound monofilament line. Carter prefers a 7-foot, medium-heavy Big Bear Microguide Casting Rod for improved casting accuracy. The responsive tip won’t rip the hooks from the bass’ mouth while the stout backbone proves heavy enough to rip the bass from precarious areas. 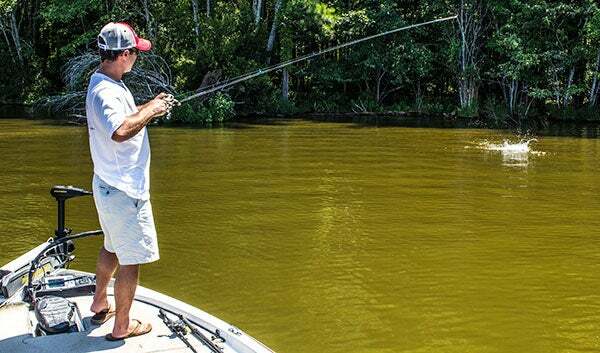 Take it from someone who recently got embarrassed by a prop bait—go outside of your comfort zone this summer and experiment with a prop bait. You may not catch 30 fish per day on it, but you’ll be pleasantly surprised by the number of quality bites it creates. To purchase Carter’s custom Bass Hound prop baits and browse his selection of outstanding, hand-carved balsa crankbaits, visitHomeBrewedTackle.com.